By 1912, ministers in Buenos Aires were finding it increasingly difficult to lease suitable premises: few houses were available, and they were exorbitantly expensive. The Treasury had agreed to buy a house for up to £25,000, but this was not enough. Eventually, in 1924, a property at 1845 Avenida Alvear was bought for about £50,000 from Messrs Drysdale Bros and Mrs Mackinnon. Some adaptations were made to it at the time, and in 1934 a new storey was added and central heating installed, but it failed to find acceptance as a longterm residence, mainly because it had almost no garden. 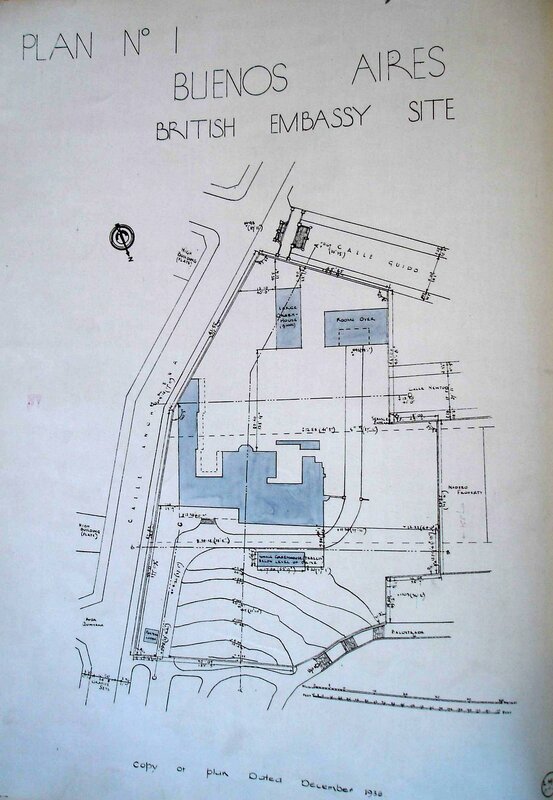 In 1938, a thorough search resulted in a 9,000m² site at 2412 Calle Dr Luis Agote (formerly Calle Anchorena) being bought for £63,000 from the legatees of Donna Maria Manuella Pearson. 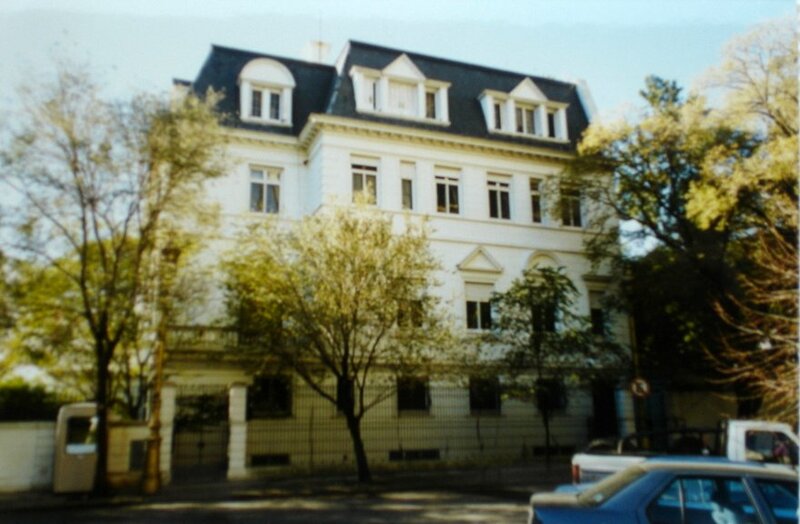 The site contained an old and rambling house, with early associations with the British in Argentina, into which the ambassador moved, pending future plans either to restore it or build offices on its site. Intentions changed after the Second World War and in December 1945 an adjoining property, 2301 Calle General Gelly Y Obes, was bought from the Madero family for about £125,000. 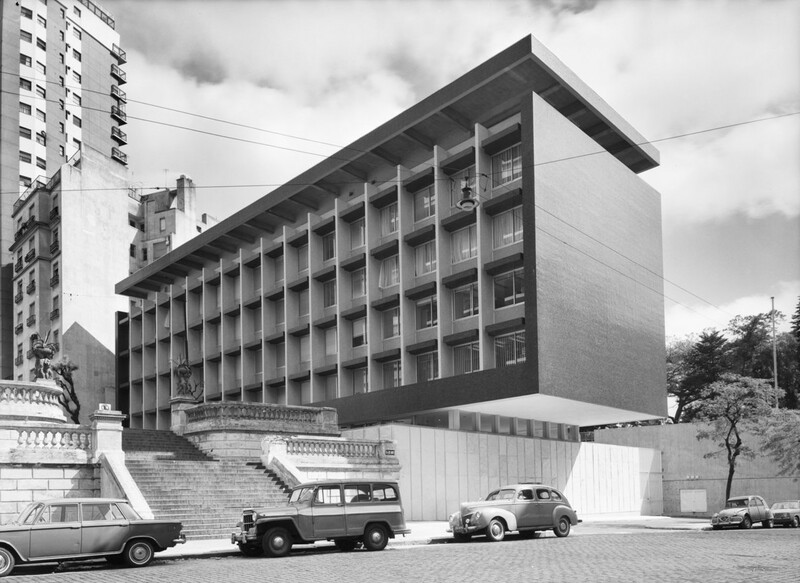 It was a large, four-storey detached town house, with a relatively small garden, in a prominent position near the centre of the district of Recoleta, completed in 1917 and designed in a dilute classical style by a British architectural firm, Bassett, Smith and Colcatt. 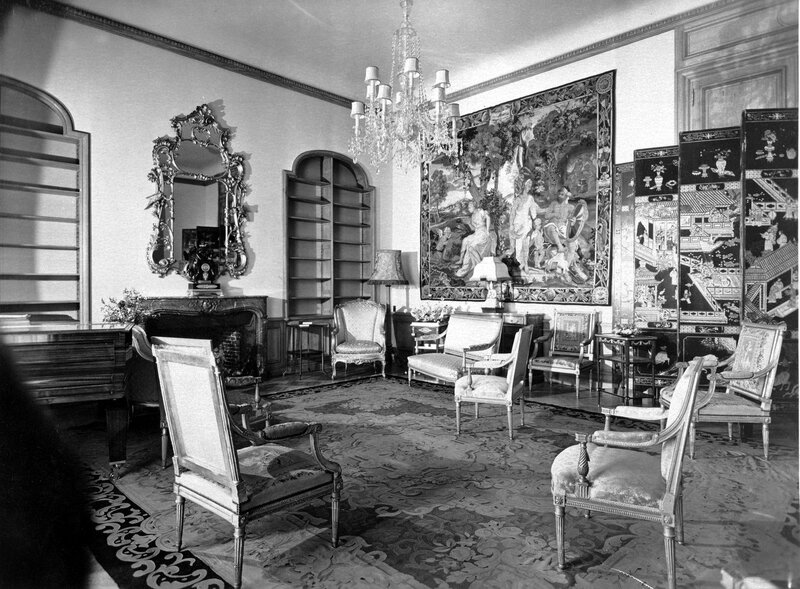 Extensive adaptations were made before the ambassador took up occupation in 1946, in which year also the former residence at 1845 Avenida Alvear was sold. The vacated old period house on the adjoining Pearson site was demolished but the whole of this site was nevertheless retained so as to “protect the amenities” of the newly-acquired Madero residence, which in practice meant providing it with a much larger garden. 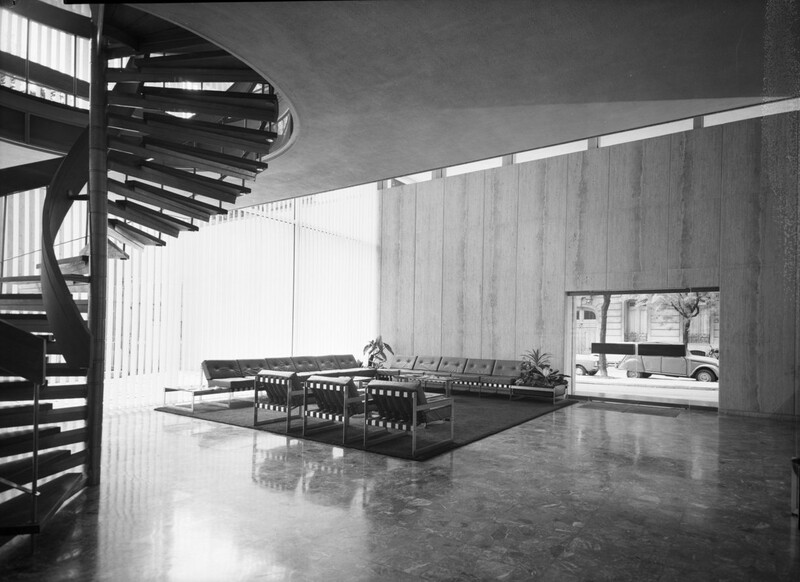 Between 1975 and 2001 there were persistent attempts to sell the Madero residence and either buy another or build a smaller one in its garden, but these debates were abruptly terminated in 2001 when the house was designated a National Historic Monument and its value for development thereby decimated. 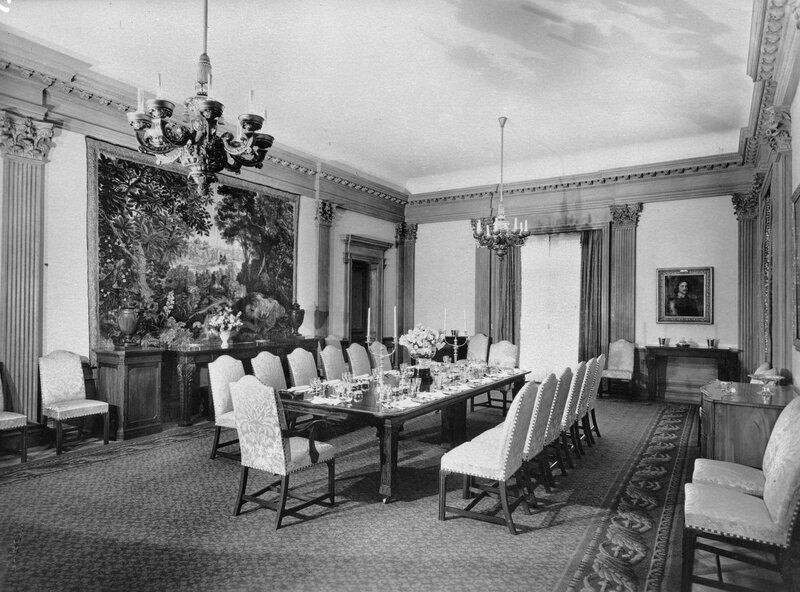 The house has been periodically refurbished, notably in 1964 and most recently in 2003 when the fine suite of reception rooms on the first floor was brought into more public use as a conference centre for up to 250 people. An Elizabeth Frink “Horse and Rider” was placed in the garden in 1991 to mark the resumption of diplomatic relations after an eight year break. Siteplan of the Calle Anchorena residence, 1938-46, subsequently demolished to provide a garden for the Madero House (at right). 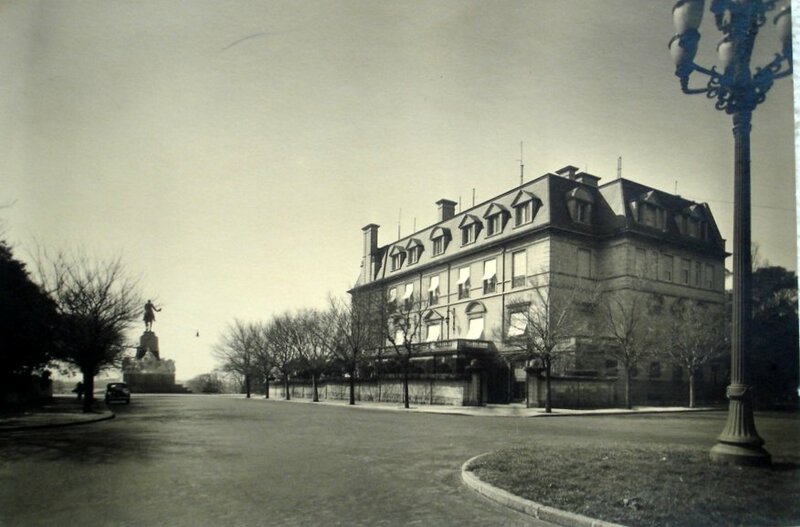 The offices were later built on the site (at top) of greenhouse and garages. End elevation of the Madero House, 1990s. 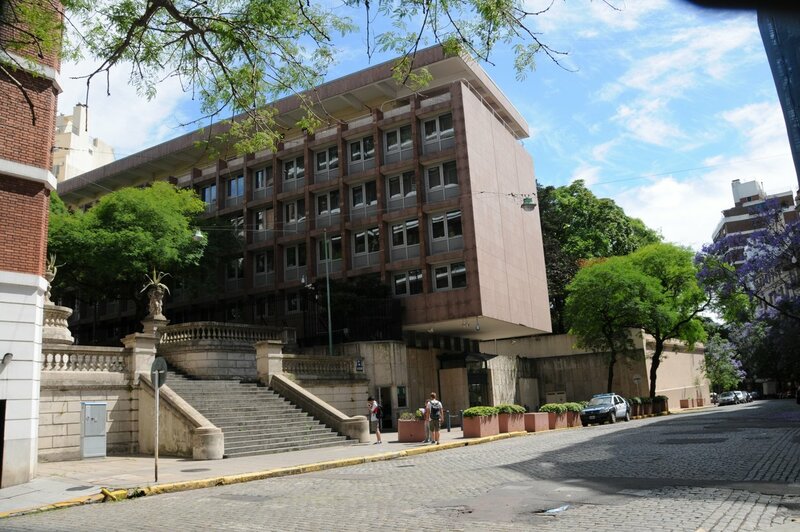 From at least 1920, the legation offices (Buenos Aires became an embassy in 1927) and the consulate-general were both leased on the upper floors of the Edificio Britanico, the Royal Mail Steam Packet Company’s Edwardian office block on the corner of Calles Reconquisita and Sarmiento. 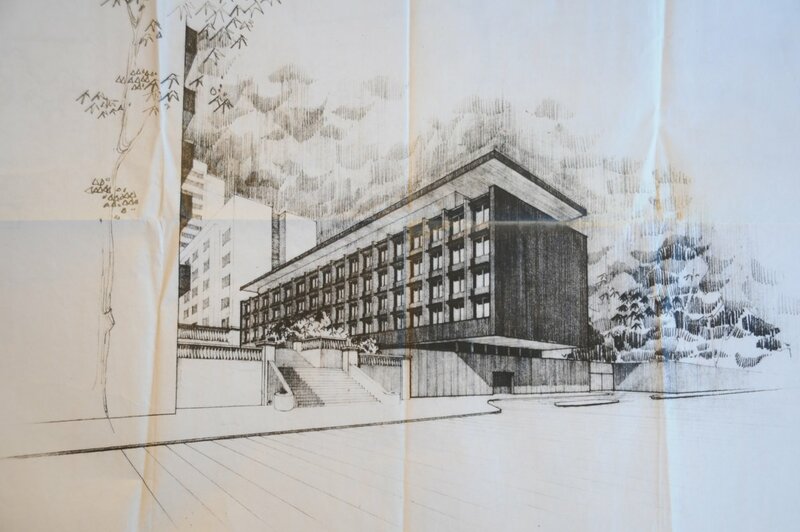 Design work started in 1960 on a new office building at the south corner of the Pearson site, where the garages had been: the intention was that the consular offices should remain in the centre of the city. 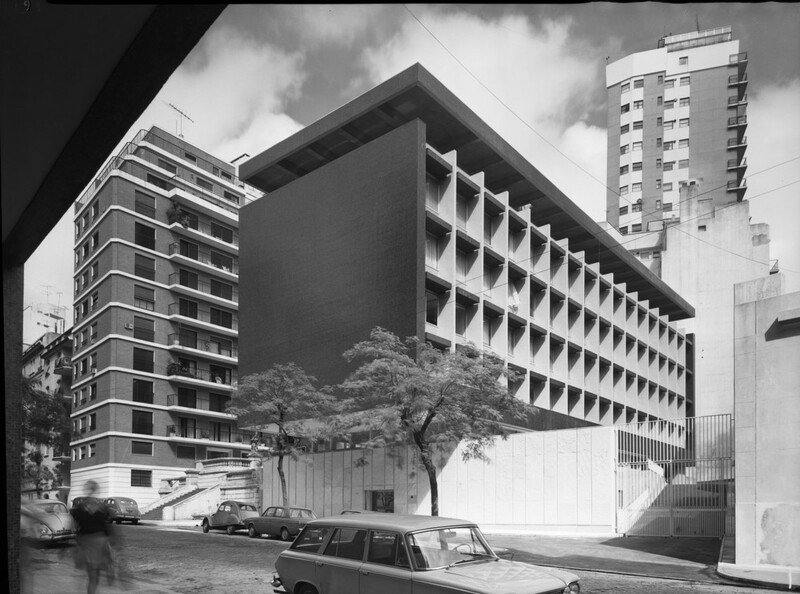 AJ Truscott was the in-house Ministry of Public Building and Works architect in charge of the job in London, and the local architect in Buenos Aires was Sydney G Follett FRIBA. The pre-contract estimate was £460,000 and the contract was let in September 1966: Prince Philip laid the foundation stone on 6 October 1966. 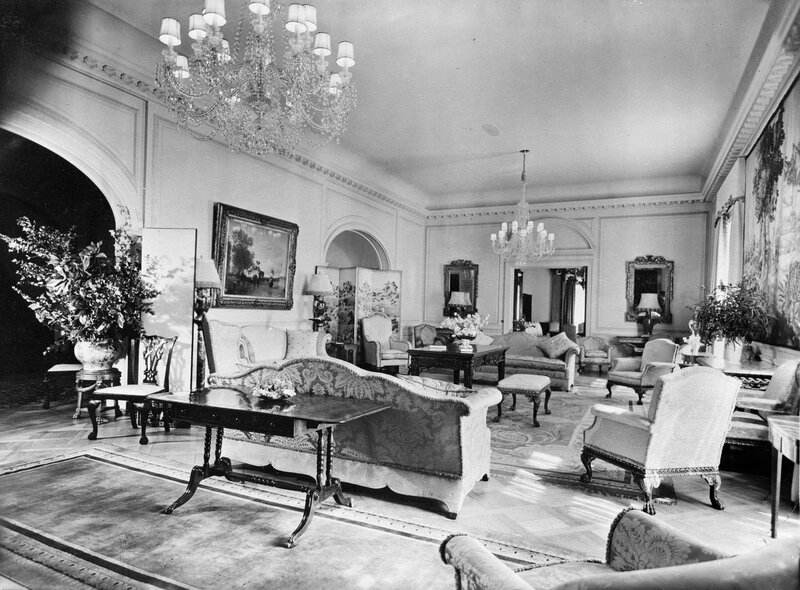 The building was occupied in 1968. 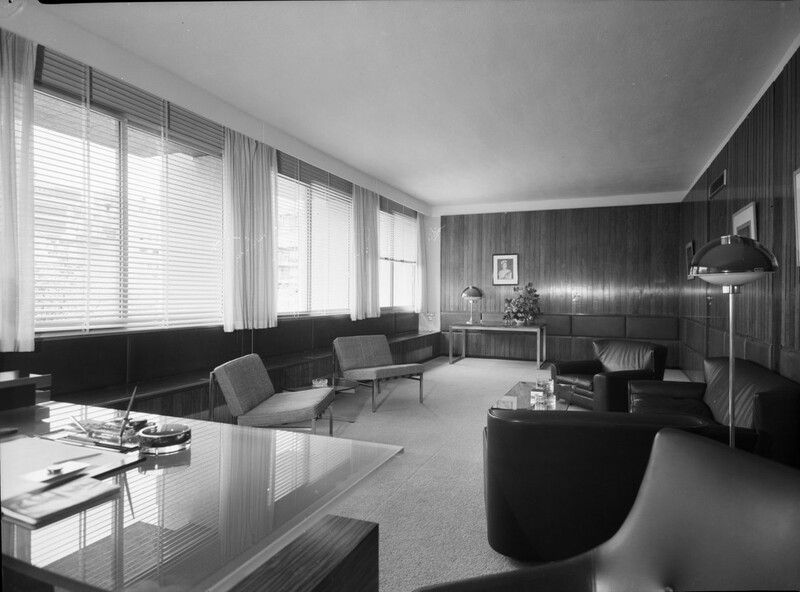 In planning terms it resembles many other in-house office designs of that era: rectangular plan, five storeys, central corridors double-banked with cellular offices. It remains the embassy offices. The original brown vitreous mosaic skin was replaced by local stone in the 1990s, and the building was refurbished in the early 2000s. 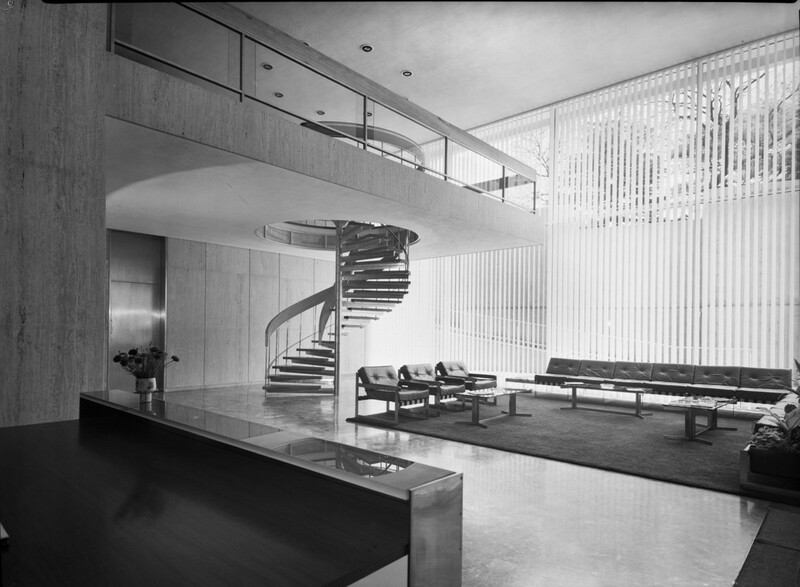 Architect’s perspective of intended offices, 1966. 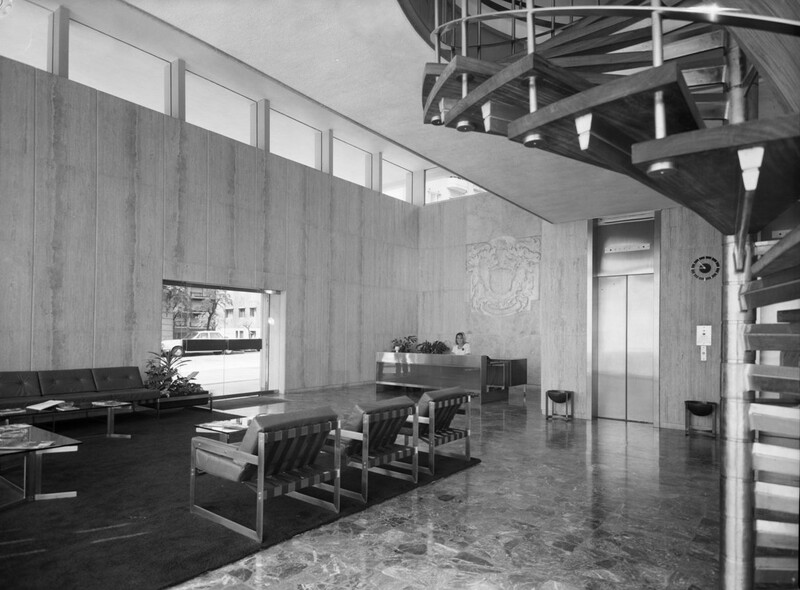 Offices reception desk and area, 1968. Stairway to public offices, 1968.